A few weeks ago I was snowed in during a blizzard and spent a lot of that time watching The Great British Baking Show on Netflix. The show has inspired me to try baking out of my comfort zone. I tend to bake cakes, cupcakes and pies; but wanted to start giving other bakes a try. Scones have been on my mind after watching the bakers make so many delicious treats. 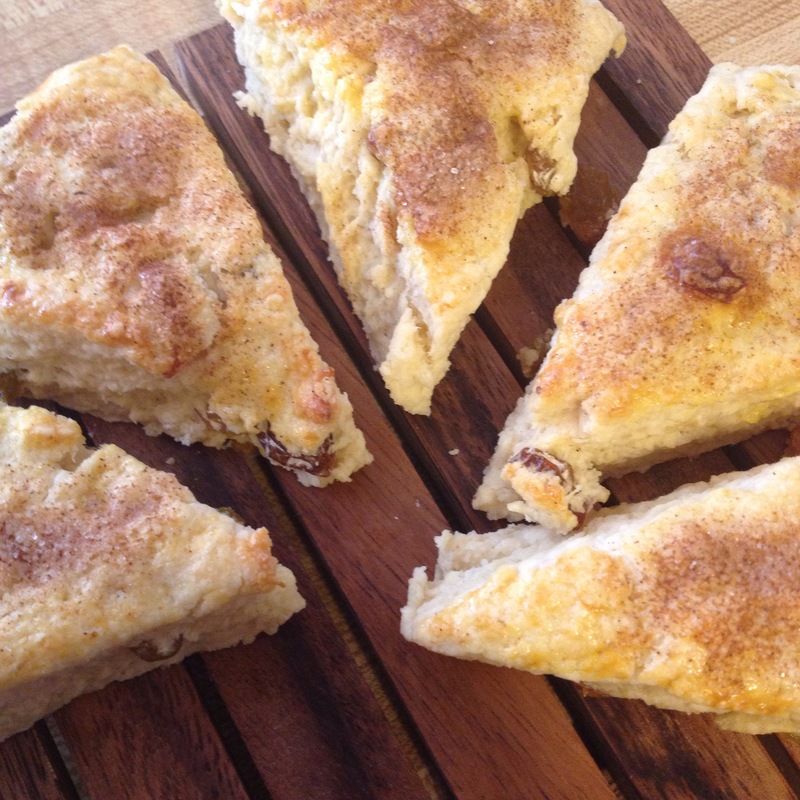 The Merriam-Webster online dictionary defines scone as a rich quick bread cut into usually triangular shapes and cooked on a griddle or baked on a sheet. The word is suggested to have originated from the Dutch word schoonbrood, which means fine white bread, and its first recorded use was in 1513. In the United States scone is typically pronounced in a way that rhymes with tone. In some parts of United Kingdom scone sometimes is pronounced in a way that rhymes with gone, and in other parts the way the rhymes with tone. 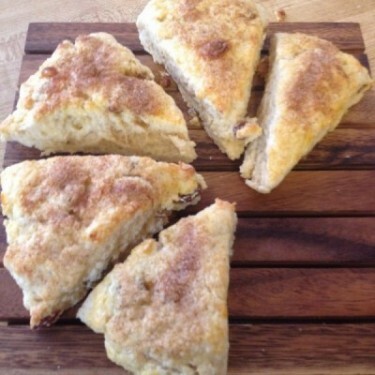 In the United States, scones tend to be a sweeter version of a biscuit. Scones can be flavored with dried fruit, nuts, seeds, chocolate, cinnamon, coffee or even vegetables. 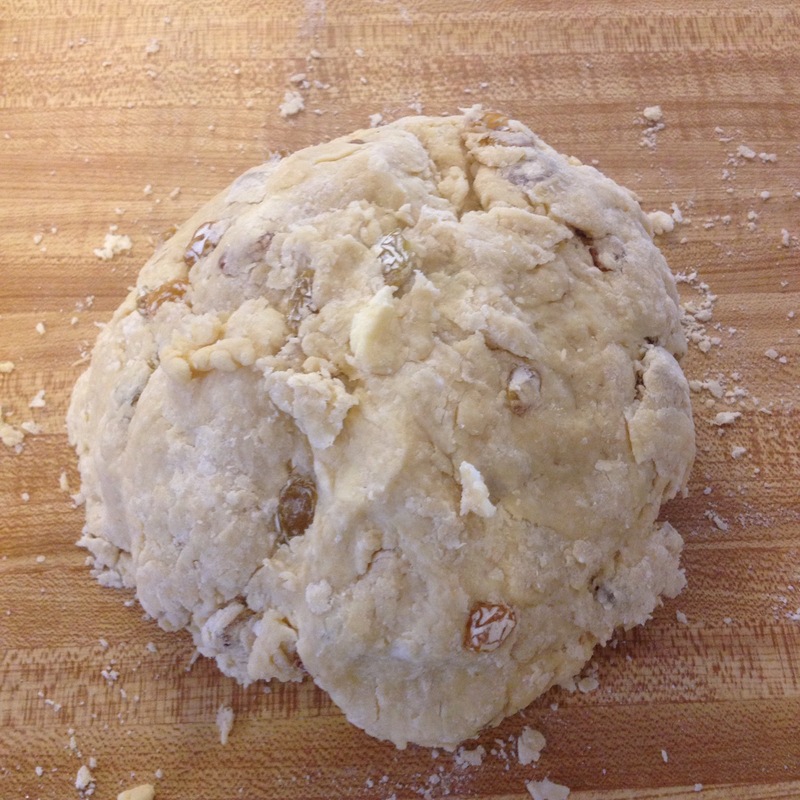 This week I tested the Basic Scones and Variations recipe from The King Arthur Flour Baker’s Companion. I was a little nervous at first because the instructions are two pages long! I took the instructions one paragraph at a time and the recipe really was pretty straightforward. First, I set out all the ingredients to make sure I was prepared for each when the time came. I prepared the dry ingredients including the dried fruit. I chose golden raisins because I love their flavor. Next, I prepared the wet ingredients and set aside. I used kefir whey in place of milk. Like buttermilk, its acidic interaction with the leavening agent gives the scones a tender, flaky consistency that is higher-rising. After that I prepared the fat. It is important in this step to have cold fat, so I put a stick of butter in the freezer the night before and shortening in the fridge. 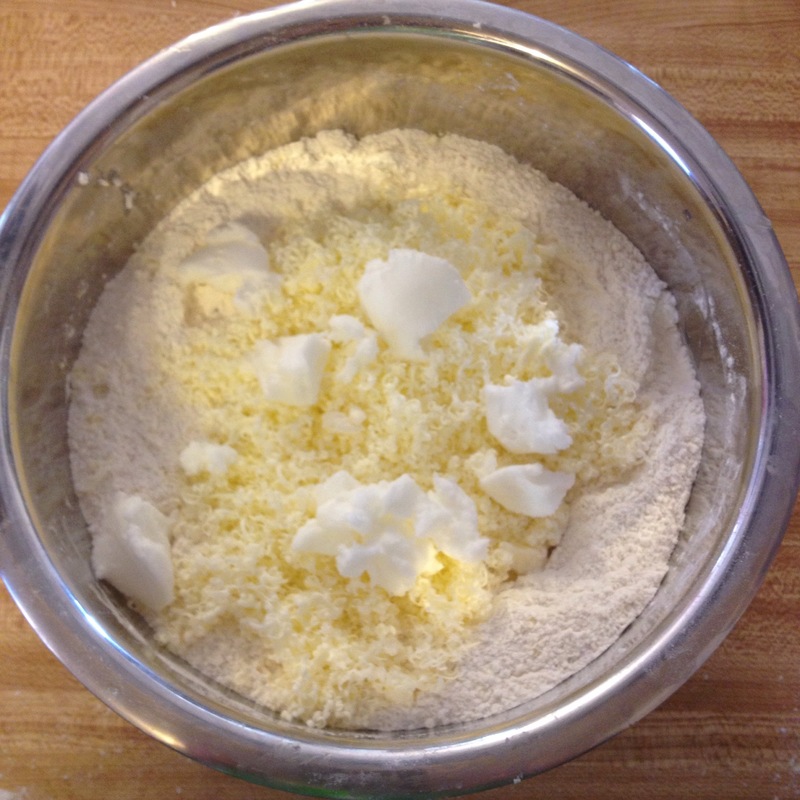 I grated half of the butter stick into the bowl of dry ingredients. Then, I measured a fourth of a cup of shortening and spooned marble size pieces into the bowl. 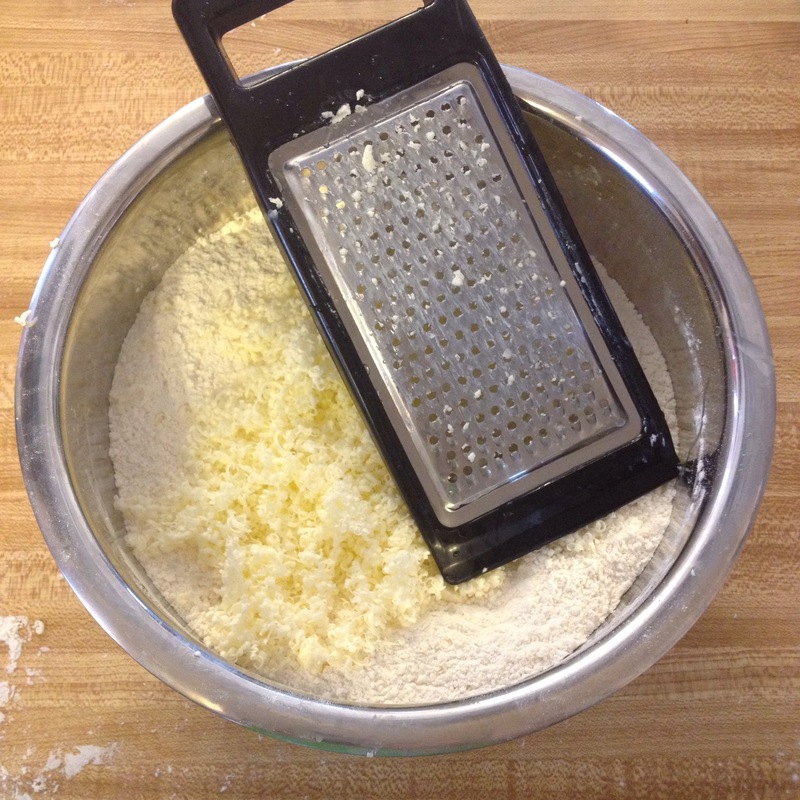 I then used a pastry blender to cut in the fat, making sure not to cut it in too much. It is important to keep some of the pieces of fat the size of green peas, otherwise the scones will turn out rough and dry rather than flaky. 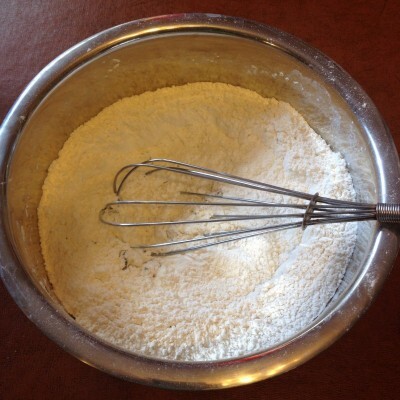 Following that I folded the wet ingredients into the dry ingredients, being careful not to mix too much or the scones will be tough and heavy. 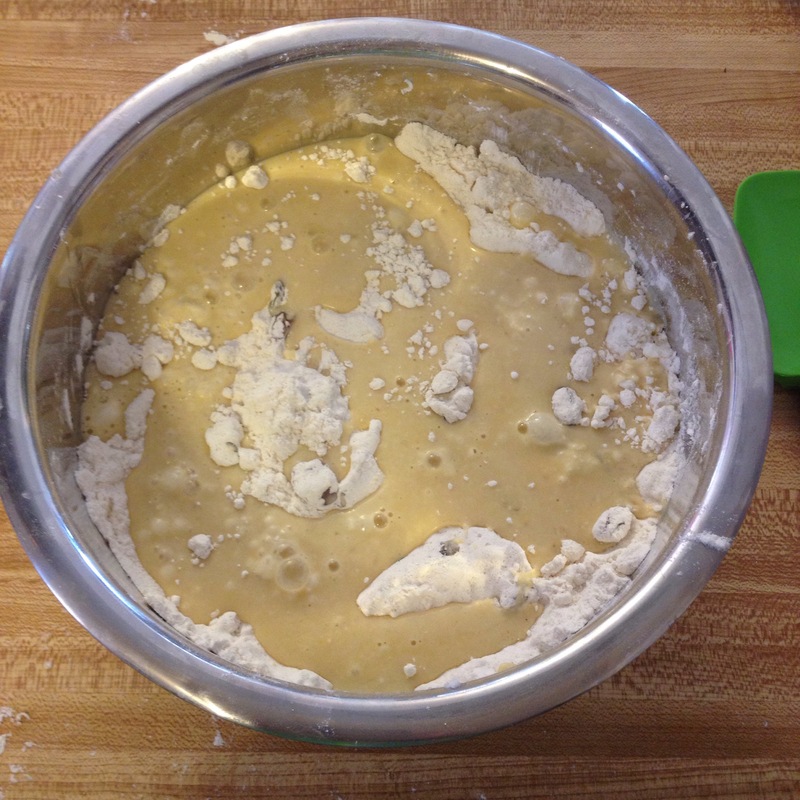 I mixed until everything was mostly moist, but allowing some of the flour to stay dry. 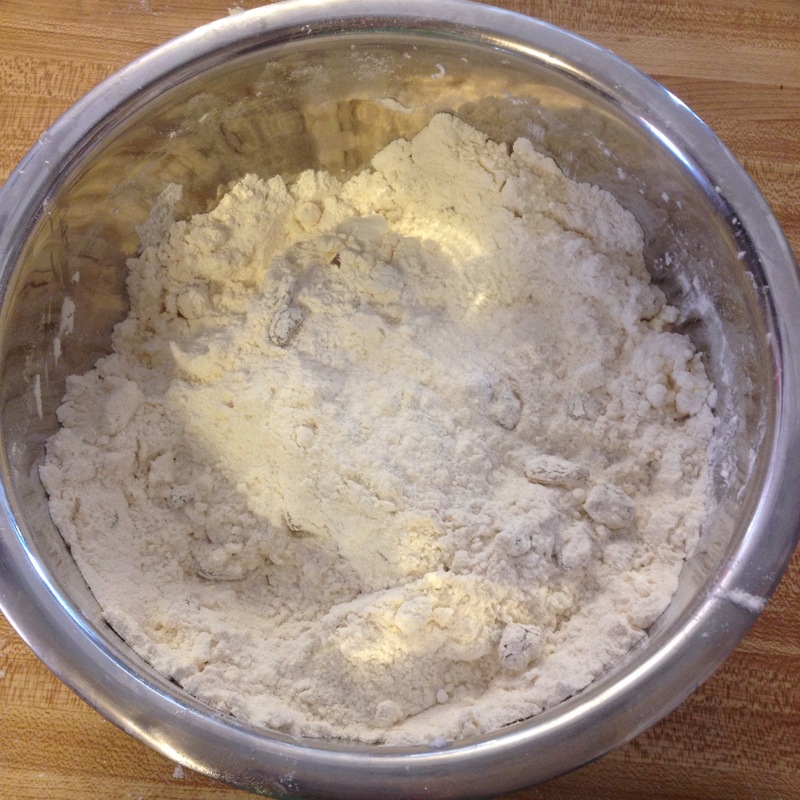 Next, I lightly floured my kitchen counter and turn the dough out onto it. I kneaded it together until it was cohesive. I cut the dough in half and placed it onto a parchment lined cookie sheet. 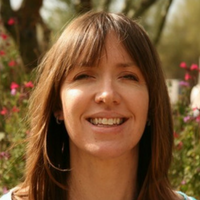 I patted each section into an approximately 8″ circle that was about a half inch thick. I then used a pizza cutter to cut each circle into 8 equal sized wedges and then pulled the wedges apart so there was about a half inch between each wedge. 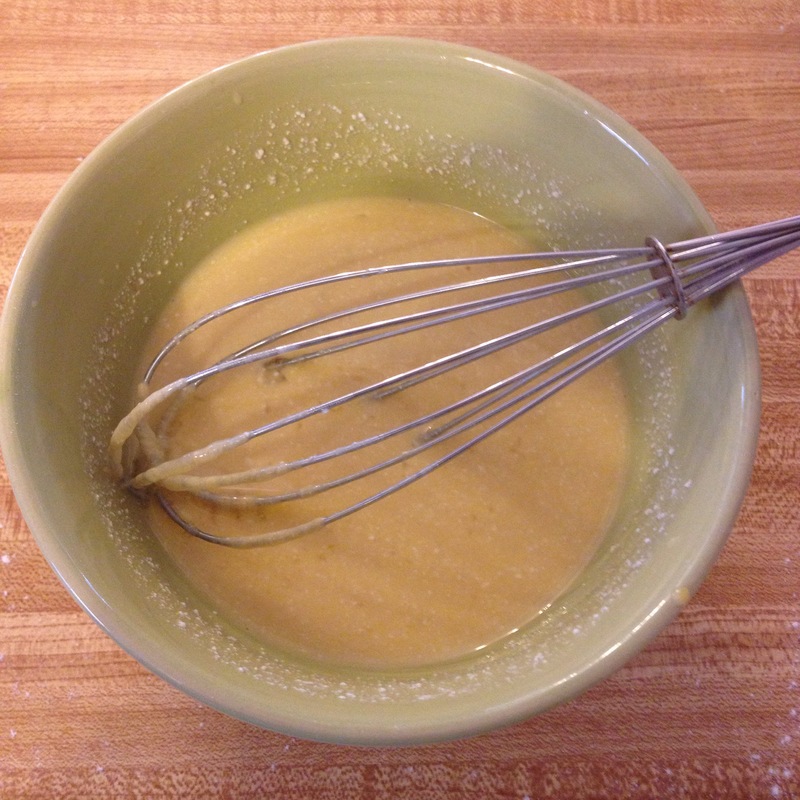 Next, I glazed each wedge with a beaten egg/water mixture. One thing I learned after the fact, is to make sure that the glaze does not touch the edges, as this can cause the scones to not rise properly. Lesson learned! I sprinkled cinnamon sugar on top of the egg glaze. I was disappointed at first that it seemed heavy handed, but in the end the cinnamon sugar tasted delicious. Then, I baked the scones for 7 minutes at 450 degree F, and after that turned the oven off, but did not take the scones out of the oven for another 10 minutes. Finally, I let the scones cool on a wire rack for a short amount of time. I really enjoyed the process and will definitely be baking them again. Next time I will have to try a different flavor variation. 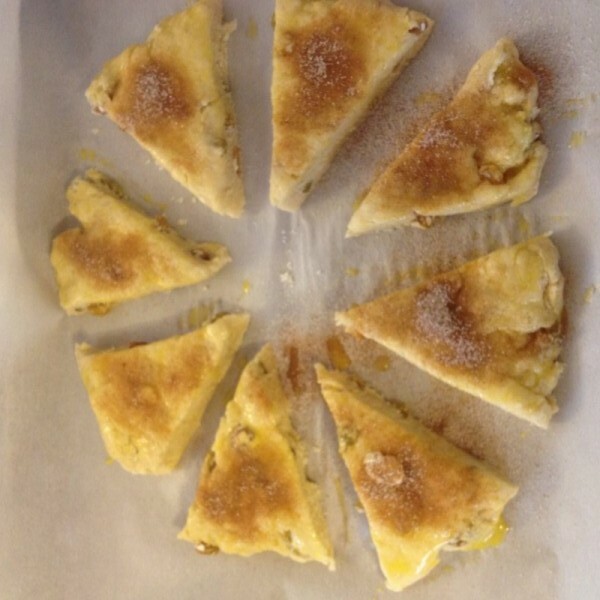 Have you baked scones before? What is your favorite flavor variation?